How Can Saw Palmetto Prevent Hair Loss? Many hair loss supplements contain the popular anti-hair loss extract, Saw Palmetto. Saw Palmetto is one of the main ingredients used to give a supplement its most potent effect. This potent ingredient is believed to be a successful additive that can help prevent hair fall and stimulate healthy hair growth. Let us examine saw palmetto’s natural sources, exactly how it can help with baldness and which kind of hair condition it really helps. The components of saw palmetto that block the enzyme work in a similar way as the synthetic ingredients in prescription medication for hair loss. Saw palmetto is a plant with small berries that has been used by Native Americans as medicine and food for hundreds of years. There is evidence that this herbal remedy may treat an enlarged prostate. It also has been used to treat hair loss, bladder infections, prostate cancer, and decreased sexual drive. Research on the effectiveness of saw palmetto in treating hair loss is promising. An extract of saw palmetto berries may block 5-alpha-reductase, an enzyme that converts testosterone to DHT. DHT is the molecule responsible for hair loss, and also is involved in the enlargement of the prostate. A study was taken for men with moderate cases of male pattern baldness where they were given a saw palmetto oral supplement to take twice daily for a few months. When asked to rate their balding patterns before and after the study, over sixty percent reported that their condition improved. How can Saw Palmetto benefit women with thinning hair? Saw palmetto extracts contains various benefits for women, most of which have to do with hormonal balancing. It has been stated that taking the herb can enhance breast size and may also be used to regulate periods, reduce cramps, and regulate hair growth. 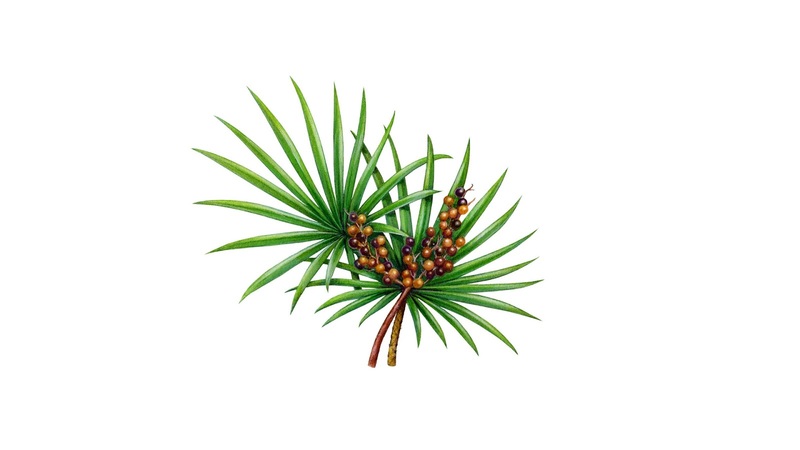 Saw Palmetto has also been associated with being excellent for minimising skin complaints such as acne. Research conducted for this herb has resulted in its usefulness for men, specifically the plant's ability to treat benign prostatic hyperplasia (BPH). Saw palmetto is thought to work on BPH by lowering levels of testosterone, a male hormone, and it is believed to work in the same way for women, by regulating and equalising hormone levels in the blood. A well-documented benefit of saw palmetto is that its properties also make it helpful for women with thinning hair. Whether in supplement or serum form, saw palmetto doesn’t actually cause hair to grow, but can impact the chemicals and signals in the body that are either shutting down or increasing production at the hair follicles. Because of this, women who suffer from thinning hair may see added thickness and density during a consistent period of using the herb.